Heat oven to 350°F. Very thinly slice cookie dough to make 30 cookies. Place 2 inches apart on 2 ungreased large cookie sheets. Bake 8 to 10 minutes or until cookies are golden brown and crispy. Cool 1 minute; remove from cookie sheet to cooling rack. Cool completely, about 5 minutes. Meanwhile, in medium bowl, beat whipping cream and powdered sugar with electric mixer on high speed until soft peaks form. Beat in peppermint extract and food color until stiff peaks form. Transfer to serving bowl; cover and refrigerate. Pipe or spoon about 2 tablespoons whipped cream mixture into bottom of each of 10 small glass canning jars or small dessert cups. Top each with cookie. Repeat with remaining whipped cream mixture and cookies, finishing with whipped cream. Cover each jar, and refrigerate about 4 hours or until cookies are softened. Top each glass with a striped peppermint candy. Make the cookies up to a day in advance. Store in resealable food-storage plastic bag. 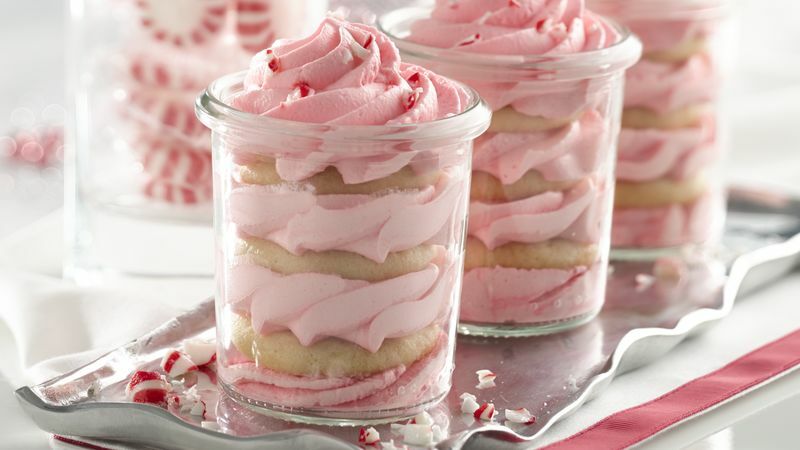 To make smaller ice box cakes in shot glasses, bake the cookies using level teaspoons of dough to make 75 cookies. Continue as directed in recipe. Makes 25 mini ice box cakes.